How can one of the most popular chew sticks on the planet be so dangerous for your pets, you ask? I mean, most dogs chew on rawhide for hours on end, and not only does it keep them busy, but they seem to last forever. Well if you understood what it took to make this toxic “raw” leather stick, you would quickly understand what the problem is. 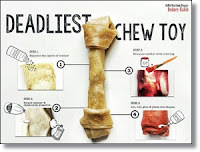 Aside from the horror stories circulating all over social media these days, of pets needing emergency surgery after consuming rawhide, the majority of pet parents today, especially the newbies, believe that this chew is some sort of dried up meat stick. Let me debunk that myth right away! A rawhide stick is not the by-product of the beef industry nor is it made of dehydrated meat. Rather, rawhide is the by-product of the “Leather Industry”, so theoretically it is a leather chew. Sounds awesome, right? So, how does this leather, which is conveniently rolled up into pretty shapes, actually get made into those rawhide chews?